Have you been diligently tracking mortgage interest rates? You should. They’re surging. Recently all the way up to 4.625%. That’s the largest weekly increase in FIFTY years! Just in January mortgage rates were 3.25%. There was no way to predict that they’d surge up 50% by 1.5 percentage points in less than half a year. Mortgage rates make the biggest surge in 50 years! What caused this? Three weeks ago, Federal Reserve Chief Bernanke stated something that startled mortgage interest rates. The announcement he made was, starting later this year and going through the end of 2014, that the US Federal Reserve plans to begin the reduction of the Qualitative Easing (QE) program. That was the direct statement that rocked mortgage interest rates and sent them sky high! Just in the first week after the announcement rates jumped from 3.95% to 4.625% on a conventional 30-year fixed loan. Just 3 months ago those same rates were hovering around 3.3%, much closer to the rates in January. If you’re anything like me, you’re nervous about the acute rise in interest rates. No one really knows. I find myself assuming that they will continue to move upward (although hopefully not to the level they were in the 80s). Using history as a guide, we can form a bit of an answer. Take a peek at the below graph. 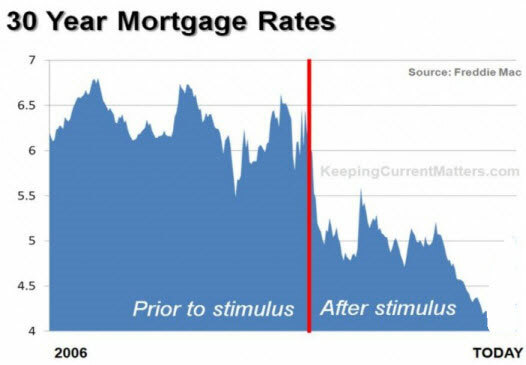 What do you notice about 30-year mortgage interest rates? There is an undeniable link to the Quantitative Easing and the rates of 30-year fixed rates. The average prior to the stimulus was roughly 6.5%, compared to today’s rates of 4.625%. We can’t predict when and how much they’ll rise, or even if they’ll dip a bit more. But we do know for sure that the Federal Reserve at the end of this year is going to cease lowering it. It’s expected that the market will flux into an average rate. That will be a rate that is not directly influenced (really, controlled) by the Fed. Are you a buyer? You must read the chart below. It scares me to even process this. 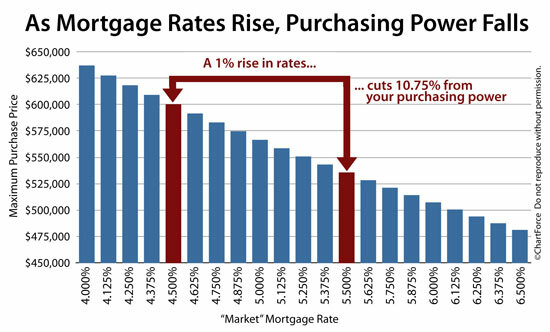 A 1% rise in rates means the buyer loses nearly 11% in purchasing power. How much did rates change between May 2013 and August 2013? 1.3% (3.3% to 4.625%). What does that equal? That means you can buy 14% less home. To put this in the figures of cold, hard cash: the buyer that was approved for $400,000 can now only afford $350,000. Ouch!! The graphic below will encourage you that we’re still in good times. A rate of 4.625% is incredible to when my parents were buying their first home in the 80’s. Looking over 30 years of average rates we’re still enjoying good times. As we’ve been in the 3 percent range for a few years we probably have taken low rates for granted. I was just telling my buddy John—it’s time for those that have money to get more of it. If you have the money to invest in real estate, this is the hour. Remember—a 1% rise in interest rates means a 10.75% reduction in your buying power! Over the past 40 years the average 30-year fixed mortgage rate is approximately 8.7%. It’s been at 6.5% the last decade—meaning being below 5% is still very good. If you’re going to buy, waiting even a month can make a big difference in rates. 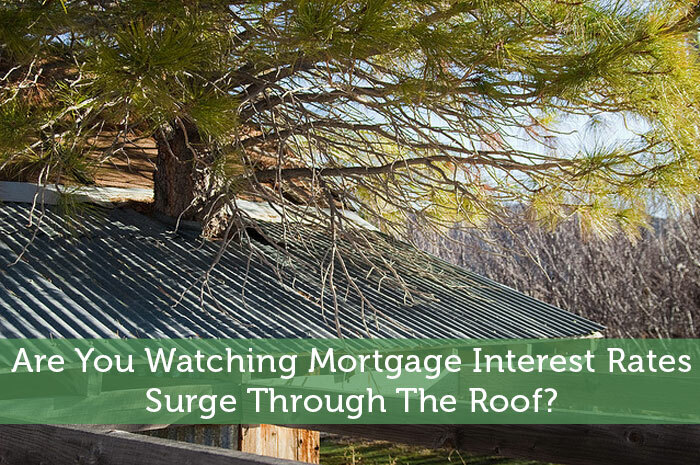 Are You Watching Mortgage Interest Rates Surge Through The Roof? This is worrying me because my wife and I are looking at buying a home at the beginning of next year. I don’t know where the interest rates will be, but hopefully we can get it under what we are paying now. Who knows what the rest of the year will bring. I encourage you to get moving on it as quick as you can. I wouldn’t anticipate rates going back down. The upside is that rates are still at an incredible place right now and will be for a while longer. If you aren’t going to buy for a few more months you’ll at least be buying during a less competitive part of the year! Nice article Todd…a lot of good information. I always tell my clients to buy a house when it makes sense for them. In other words, buy when you can afford the payment. Don’t buy because you have to hurry up before rates get too high. Or because you are concerned prices are getting out of whack. That is the kind of thinking that got people in trouble in 2003-2005. If you buy using a loan that matches your goals resulting in a payment you can afford, you won’t get in trouble. As a matter of fact, I would rather buy at higher interest rates and lower home prices than vice versa. At least you lock in a lower property tax basis and lower loan amount. Plus, if rates ever dip below your acquired loan rate, you can possible refinance to get a lower rate. But you can never buy the house again for cheaper to lower those tax rates. Chad–great insight, advice, as well as a warning. Buying within your payment range is critical–and it’s better to wait to get the house you want (that you’re committing to for 30 years) at the right price than to feel pressured or rushed into something. We’re planning to remortgage our primary property in December 2013 and then buy another rental property in December 2014, so I hope they don’t surge up anytime soon!! In the UK, the bank Governor of the Bank of England recently suggested that base rates would stay low for the foreseeable future (with some caveats), so I’m hoping that this means that interest rates should stay fairly low in the short to medium term. I love reading insight on real estate and banking in other countries! I was recently corresponding with an Australian advertiser and was very interested in finding that their real estate market has been very strong and is/was unlike the dip that us Americans experienced this past decade. I was gonna ask why I should care since my wife and me are only a few years away from paying off our mortgage entirely! We even refinanced a couple years ago. But I guess at the way end you make a good point. If rates are getting crazy, maybe we coudl think about refinancing again! I don’t know the numbers–but if a loan officer says it can save you big bucks, then consider it! Have you chewed on buying a rental property? Even with the sharp increase, mortgage rates are still at historically low levels. I am very concerned and hope they go back to the previous low levels because my wife and I were looking into buying a place and the 1% increase makes a pretty significant difference in what we can afford. I wouldn’t count on it going back down considering what the Fed has said :(. But, as you reiterated, they are still at incredible levels. I wish I had the money right now to buy several properties! I missed out on refinancing my house….hopefully my house is worth a little more due to the upturn…we shall see! We aren’t planning on moving any time soon, but rates could be good or bad for our rental property plans. It might be harder to buy another property, but on the flip side, higher rates will mean more people having to rent longer. Our first mortgage was over 8%, so I think you can always find a house to buy, just maybe not as much house as you could with super low rates. Compared to 8%, these are pretty good rates. Is refinancing an option? As a veteran of the mortgage business, I can say categorically that rates rise much faster than they fall. A rate decline that took two years to play out, can disappear in a single week. Unfortunately, consumers get complacent about low rates, and many will be kicking themselves for not acting when rates were at record lows. What we really need to be concerned with is the potential for this to be a reversal of the bond market bull market that’s been reliably in place for more than 30 years. It’s too early to tell of course, but if that’s the case we may never again see rates as low as they were last spring. It could be the beginning of a new paradigm in rates. But we shouldn’t forget that rates the past few years have been artificially low thanks to QE. I also agree with what Chad wrote in his comment, that it’s better to buy when mortgage rates are high. Prices are lower, and you can always refinance later if rates drop. Thanks for re-enforcing Chad’s comment! It’s great to get an experts insight. Am I understanding correctly that you think this era of low-rates may be the new paradigm that is long lasting? Interest rates go up and down. The same holds true for the stock market. Timing the market is almost impossible, except when the government intervenes and/or changes policy. Fortunately interest rates are more predictable, especially when there is a single entity or person (the Fed) controlling them. I’m not advocating for the Fed and it’s decision-making process with this comment, simply stating that it’s predictable as to where rates are right now and that they are guaranteed to go up as they will no longer keep them artificially lower. Both mortgage rates and housing prices have gone up. Have personal incomes also gone up the same amount? Not so much. Lenders are also easing up on mortgage requirements. Housing Bubble 2.0? I’d like to explore your comment more. Could you go further into why you believe those factors may lead into housing bubble 2.0? Good score!! Phew, good thing you came in right under the gate! I have a bit of a sick feeling in my stomach that I don’t have the money at the moment to buy up lots of properties! It truly is a time that the rich can get richer. Don’t be discouraged. The rates next year will still be at all-time great levels. Just don’t delay when it’s time to start making a deal if a good one comes to you! I look at things a bit differently. There is a given supply and demand for housing in each regional market. Where these meet forms the price the property will exchange hands. If interest rates rise and all of the same buyers exist, I would submit to you that this would cause property values to fall. This would have to be the case, or no properties would change hands. The $400K house would find less buyers, so the ask price would have to be reduced. This is why housing went crazy in the 2004 – 2007 time frame. 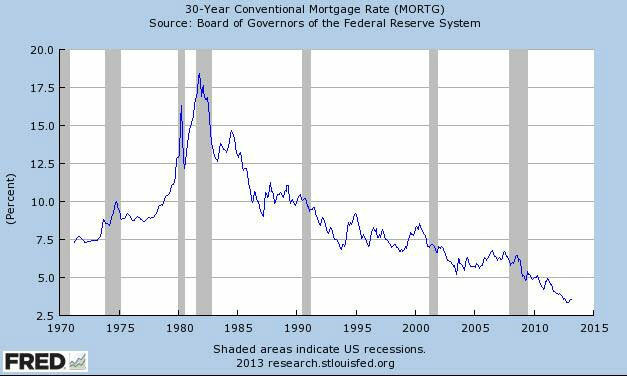 Lower interest rates sponsored by the Fed to create a housing bubble to get us out of the dot-com crash. I believe the Fed is artificially lowering interest rates to zero to get a housing recovery. The only problem is that when rates start to rise, current house values will lower and stall the housing recovery. I think the Fed is truly painted into a corner on multiple fronts. Derek–I think what you said certainly does have a bearing on valuation–what a person can afford and what they can pay. So if interest rates skyrocket, a person will be approved for a smaller loan then can only buy less. That equation is true. But the other factor IS supply and demand. But from what we’ve seen–in many but not all housing markets–is that lower interest rates are not increasing sale prices at the same increments I refer to (10.75% for every 1% rise). We’ll see what happens here in the next couple of years. I think housing prices usually lag the overall interest rate influence by six months to a year. Everyone knew that interest rates would rise at some point! Those who bought properties in the last 5 years or so and have only known super low interest rates should be weary. As long as people are prepared for further rate increases, everything should be fine. This is another example of how overstretching to buy the big dream house you always wanted can be a poor financial decision. Personally I just don’t see them skyrocketing anytime soon. It would just mess with economics too much. I don’t think anyone is in a rush to see a bunch more foreclosed homes after the previous mess.